Dividing and conquering convergence quilts are a lot of fun. Take out that special panel/piece of hand-dyed fabric or contrasting fabrics and let the fun begin! 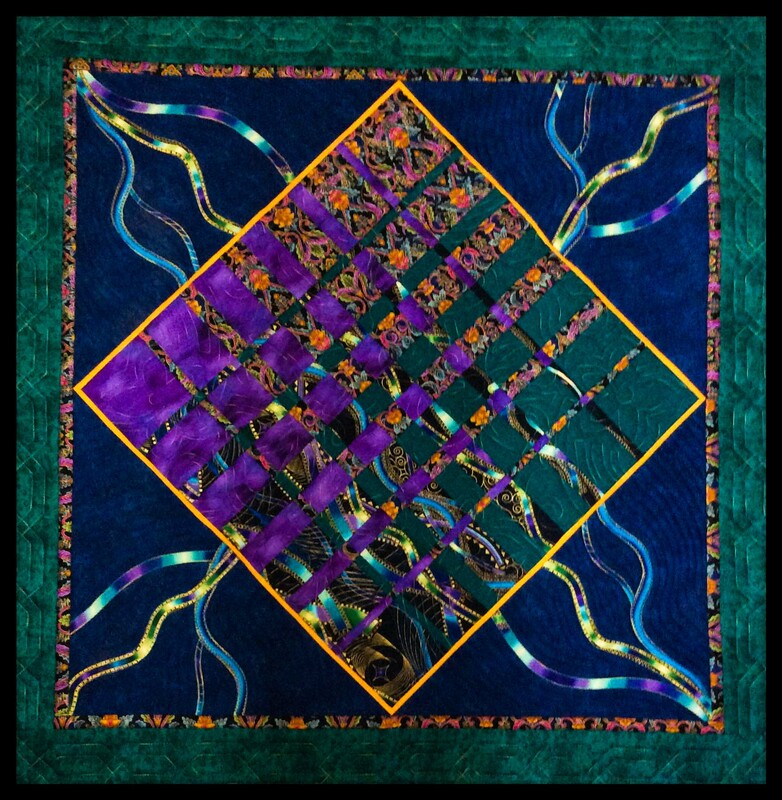 Stop petting those wonderful panels and beautiful fabrics and use them in a Convergence quilt. You won’t believe what you are able to do with a cutter and ruler! 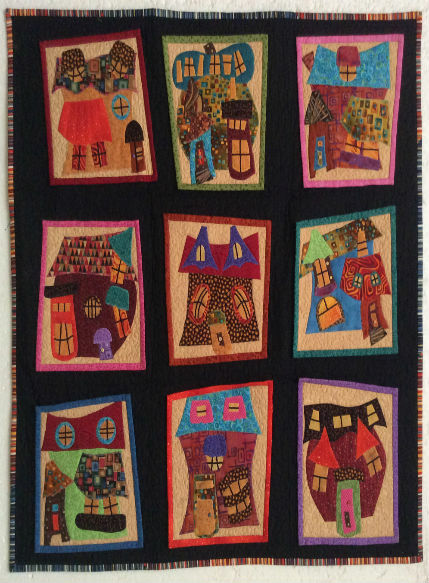 Let's make an innovative art quilt! While having fun learn about design and colour. You will enjoy creating your own design and develop several techniques in the process. There are many ways to make quilts. In this workshop you will find your own path! Are you afraid of matching difficult angles and creating sharp points instead of dog ears? Then this is the workshop for you! 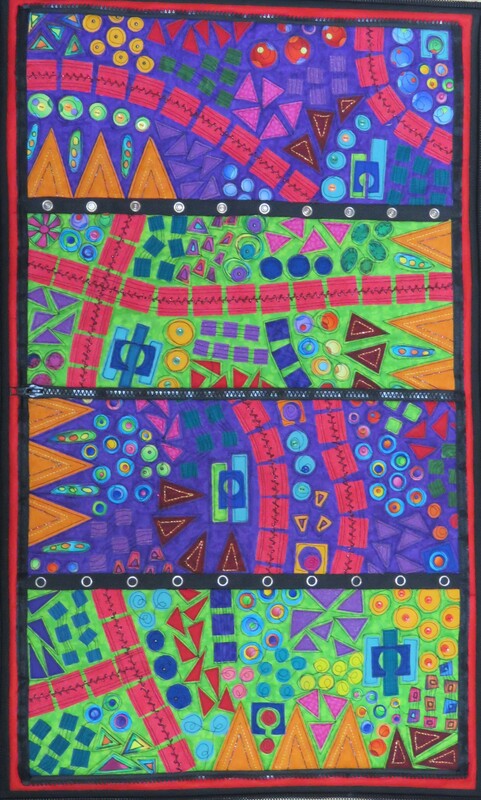 Play with colour and create your own unique quilt. You will be so glad that you have accepted the challenge! In this workshop we are going to make a thread painted animal. Even a beginner can thread paint using my technique. You don't need to draw at all! And on top of it all - the animal will be 3D! Don't be afraid! This is new, exciting and lots of fun! Give the painter in you an opportunity to emerge and the result will be mind blowing! Have you ever wanted to make an innovative quilt from your scrap basket? 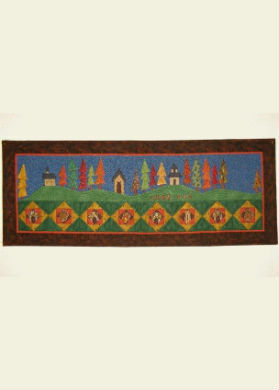 Do you want to create your quilt without any appliqué and ironing? It is easy and simple and the focus is on creativity. It is addictive, easy and the results are spectacular! You won't be able to stop using this technique once you've start using it! 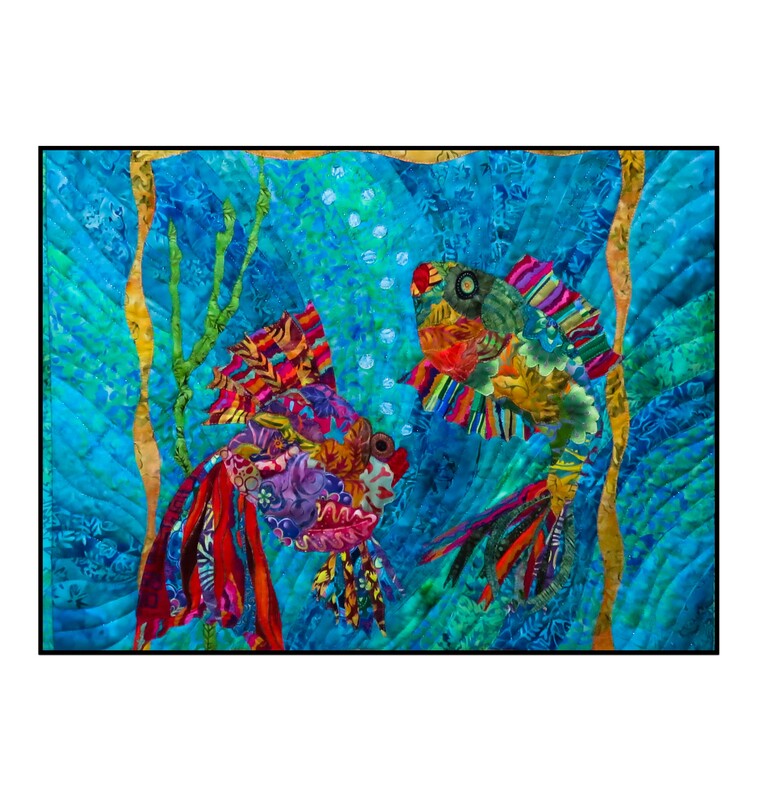 Let's Make an art quilt and while having fun learn about design and colour as well! 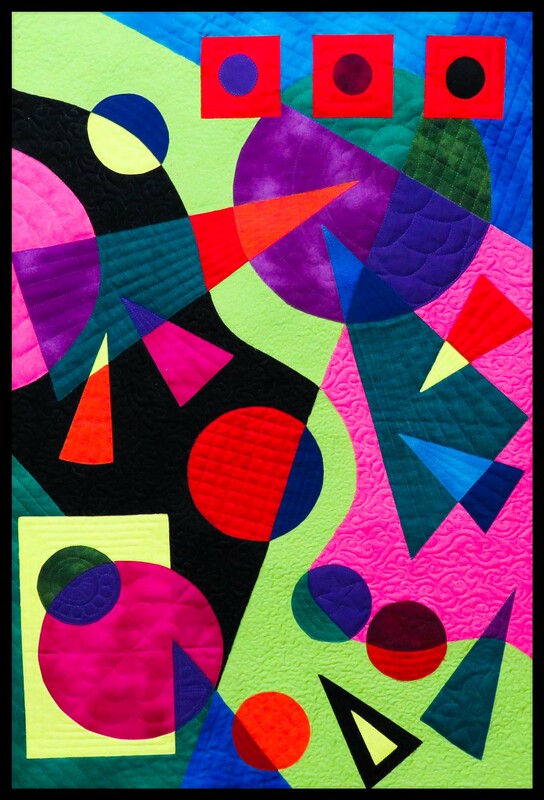 This is an easy way learning about all the design principles and designing your own quilt. Small sections are much easier to quilt! Come and have fun. This is a stress-free class! Owls are wise old birds with a lot of character! During this workshop you are going to create your own owls, make them 3D and give them a personality of their own. You will start the workshop with a smile and end the workshop laughing out loud. You can make your head master, your best friend, your child and even somebody who gets under your skin! Give your creativity wings and enjoy the flight! Have you ever wanted to put your precious memories of loved one’s into a portrait study? Do you want to create memories that will last a life time? Bring your photos and let’s do it! Do you want to make very small realistic landscapes? Look no further. You bring your photos and we will make these 3D postcards. 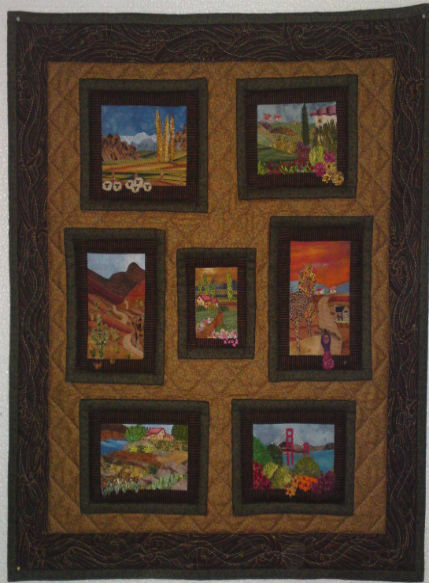 You will be able to revisit all your favourite places on this quilt. To put some fun in it, we are going to raise the surface. You will want to touch them. You will be the talk of the town doing these landscapes and your friends will envy you! Do you need an almanac with attitude for your home? 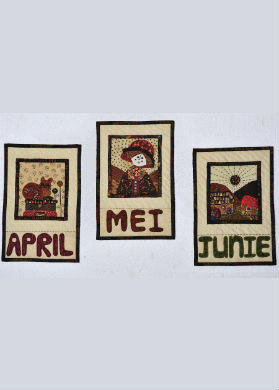 Create a different small quilt for every month of the year. Make your first one in the class. 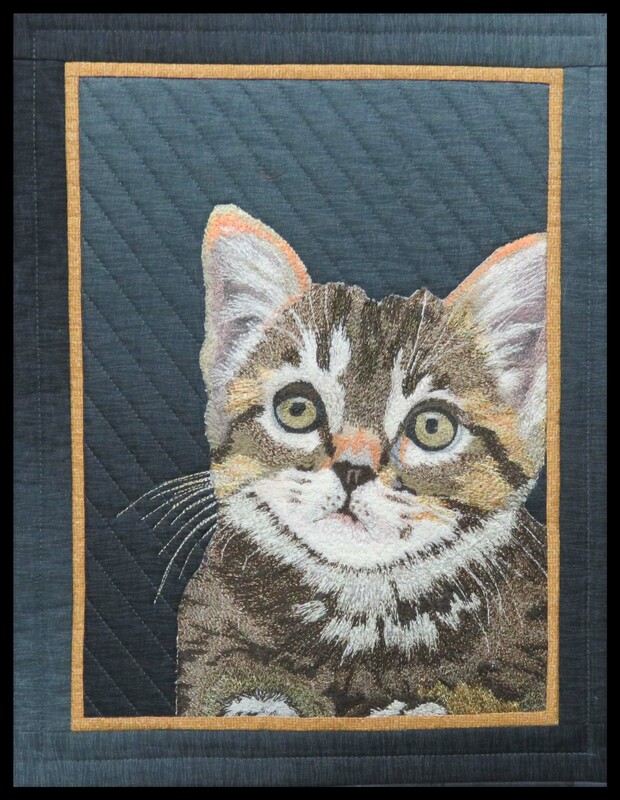 These little quilts have attitude! Let your fabric talk to you and create a one of a kind block. You won’t be able to resist making them. Maybe a year need more than 12 months or you can start a second set! 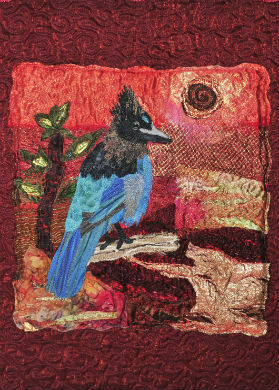 Make an art quilt with a realistic bird as a focal point. Challenge yourself to do a fabric art background and learn a new technique. I have a unique technique to show you how to achieve this quilt without any stress or failure. You can do it! This will give your self esteem a boost. Have fun and let the birds sing! Become entangled with all the small pieces of fabric you never seem to work away. Create funky houses and receive a degree in Architecture from the School of Fusing at the same time! Combine fun with the technique of machine appliqué and collage building. Play with the different shapes and lines provided and become a master architect, builder and painter in a single day! This is a class for everyone who would like some fun. No skills required. 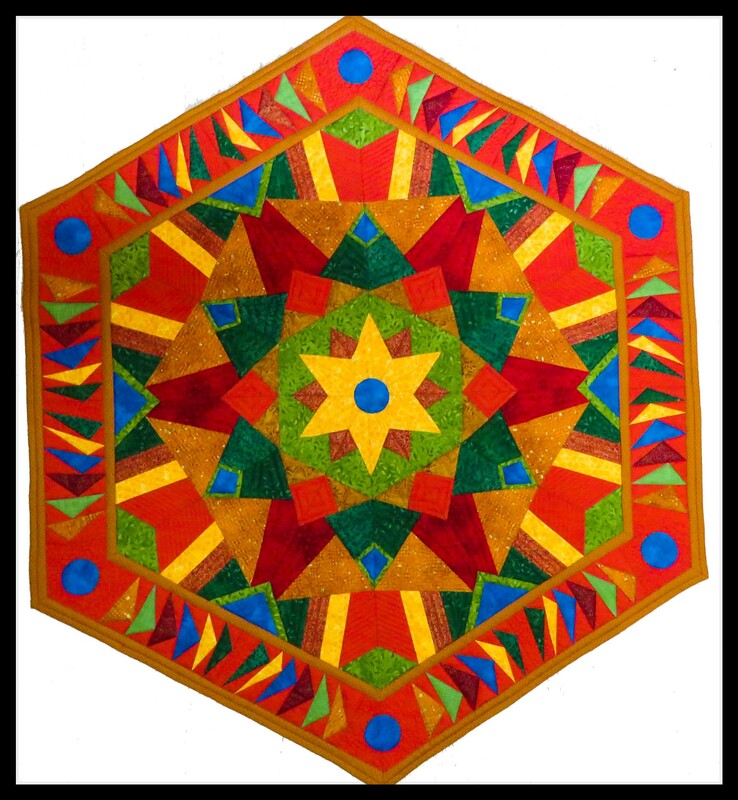 Become an innovative quilter without even noticing it. The result is a whimsical neighbourhood of houses. You will never buy a house pattern again. Once you have started building, you won’t be able to stop! Let’s go paint the town red. Have fun and create a masterpiece. You will be helped to do a traditional design, an art design or at random design. Use this technique in future and apply it to larger squares. The possibilities are endless. The roosters and hens are inviting you to join them in their chicken coop. Make them wild and wacky! They love to be the talk of the town! Come on – Let's make their day! 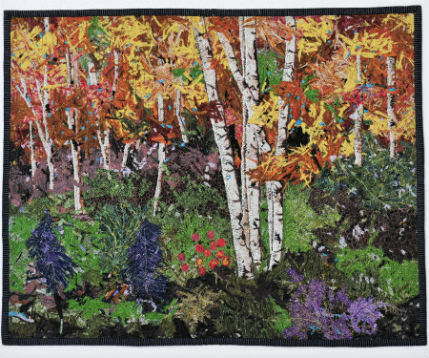 Have you always wanted to make your own small landscape? Now is the time. You choose your scenes and I will help you to design your hilltop. It is as easy as 1-2-3. Everything will be given and all you have to do is to stitch it together. 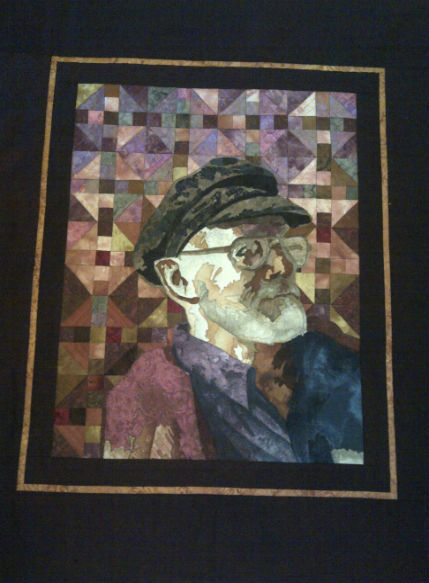 You even choose your own pictures to be included at the bottom of the quilt and how you want to make it more 3D. Do you like a challenge? Do you love maths? Don’t worry, I have already done the maths part for you to create the different patterns! All you need to do is play with your mesh strips to create these beautiful intricate patterns! After this class you will be hooked! Why are you waiting? Let’s start playing! 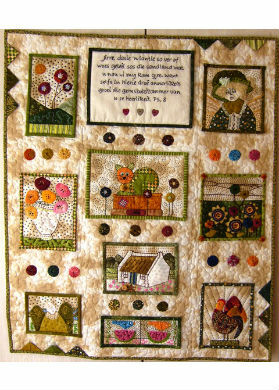 Do you have beautiful, tiny pieces of fabric that beg you to be sewn into a quilt? This is the class for you! 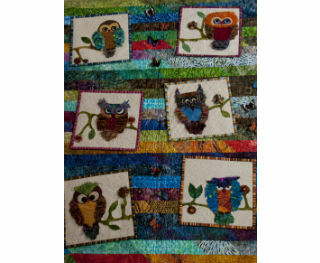 Use them to do naïve needle turn appliqué without the stress of ordinary needle turn appliqué. There is no rule except to enjoy being creative! The long winter evenings will be filled with this contagious hand work – Be warned! 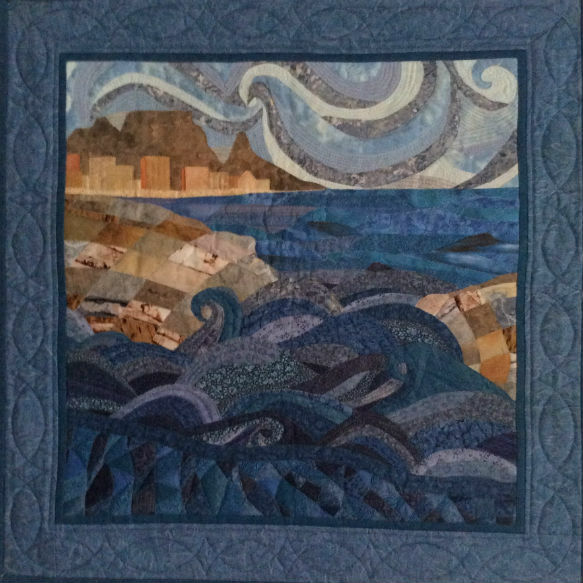 Cook up a storm by designing your own seascape! All you need is a photo or picture of a seascape and the fun starts. It is a brand new technique and you will be the master designer thereof. It is so simple even a child can do it. Nobody is going to sink. Let the wind in your sails give your boat speed and enjoy the ride! Don’t you know what to do with all the bits and pieces lying around your studio? They are just too beautiful to throw away! Cut them to matchstick size and then we will do a forest! You don’t need to be a painter. I’ll show you all the magic tricks! Go get your favourite picture of a forest and the forest will come to life under your hands. 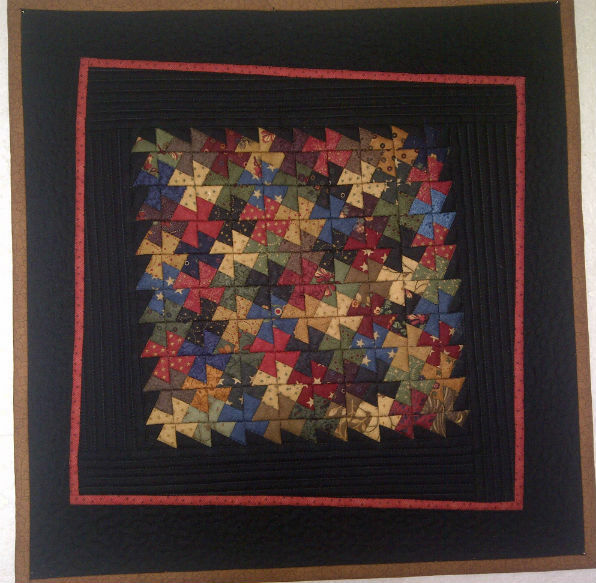 Is free motion quilting your nemesis? 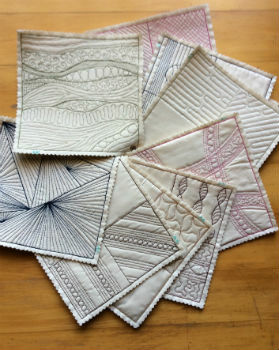 Can’t you remember how to do a specific quilting pattern? You don’t know which quilting pattern to use? Then this class is for you! 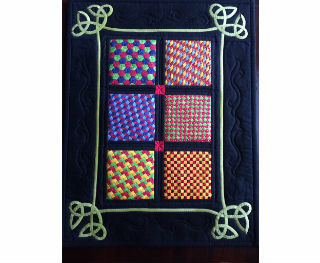 We will be making a free motion quilting sampler book where you will stitch out the different filler patterns. Start loving your machine and quilt your own show stopper quilts. Why wait – let’s start quilting!